For determination of the coefficient of kinematic & static friction, mechanical advantage & efficiency of an inclined plane etc. Glass Agencies EROSE are manufacturer of Inclined Plane. Students can determine the coefficient of static friction and the coefficient of sliding friction as well as verify the normal and frictional components of the force exerted by the plane. 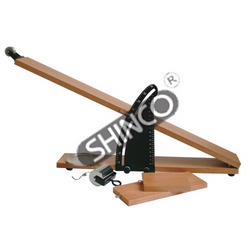 The wooden inclined plane can be set at any angle between 0 and 45° on the metal protractor. - 1.inclined plane allows the same work to be done with a smaller force exerted over a greater distance. - 2.High Quality and best instrument for students, Lab / laboratory, project. - 3.Understands basic principals of inclined plane in Physics. A plane board, 600x75mm, hinged to the base at lower end and provided with a pulley for the force string, at the other end. The inclination of the plane can be varied. supplied with brass roller 75 x 25mm diameter and scale pan. Without Masses. A plane set at an angle to the horizontal, especially a simple machine used to raise or lowera load by rolling or sliding. or determination of the coefficient of kinematic & static friction, mechanical advantage & efficiency of an inclined plane etc. Standard quality apparatus, made of wood, with graduated arc and clamping device, with rollor, brass pan and one pulley, glass on top. Quality being the main concern, we offer wide collection of Inclined Plane that is durable in nature and are offered in varied fashionable patterns. Our offered products are manufactured using quality assured material which we acquire from trustworthy suppliers. We offer these products at industry-leading rates. 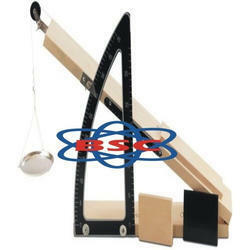 -60cm with frictionless pulley. Superior quality, adjustable with graduated cast aluminium arc, iron roller, glass plate and scale pan. Hardwood comprising, cut-away base to allow cord to hang freely and hinged plane 60x7.5 cms. with aluminium pulley 28mm diameter, and stepped lower face to accommodate wood block for setting at angles between 24° & 45° approximately with cylindrical metal roller and scale pan.